The user management tab can be found in the transaction center. This area will allow the administrator to set up users to access the transaction center. 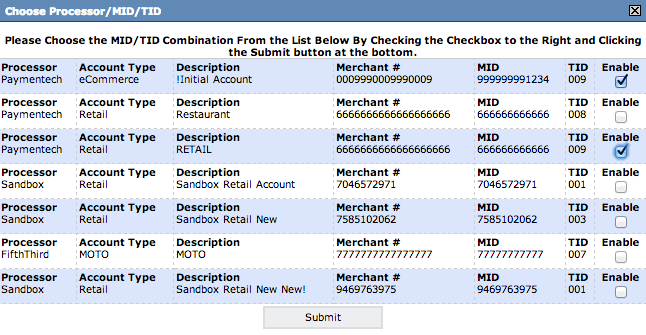 Transactions will then reflect that particular username in the transaction details. The users can be granted certain permissions. As an example, an administrator can set a user to only authorize transactions but not settle them. 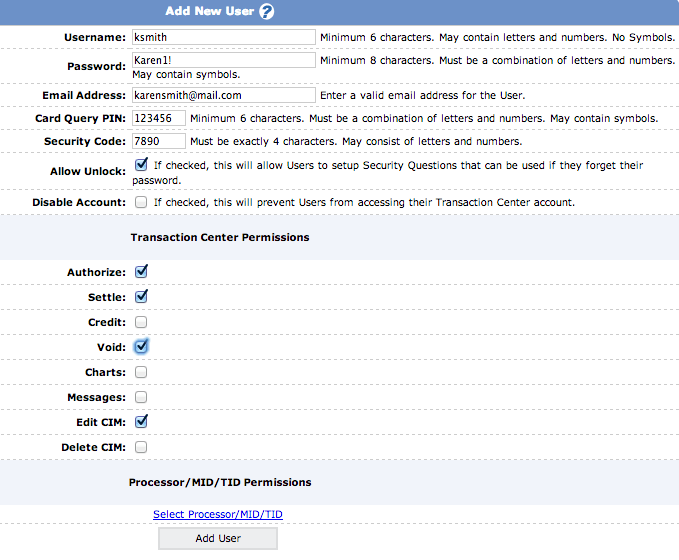 The administrator can add users and set permissions in this area. Allow Unlock needs to be checked off if this user is permitted to be unlocked by tech support. If unchecked, only the administrator on the account can unlock the user. Processor/MID/TID Permissions is the area that allows you to choose where the user has access. If there is one merchant account associated with the transaction center, the user will need to be added to it. If there are multiple merchant accounts associated with the transaction center, permissions will need to be granted to the merchant IDs that a user has access to. Click the Select Processor/MID/TID link and in the pop-up window, mark the checkboxes in the Enable column for the accounts you'd like the user to access, then click Submit. Click the Add User button at the buttom of the page. This area will bring up all users on the account for modifications or if the administrator needs to unlock that user's transaction center. Any changes can be made in this area such as permissions, disabling etc. Once the changes have been made the administrator will need to click on "update users"
If a user is locked out, they can be unlocked from here. The Locked column will be checked off, the administrator can uncheck the Locked box and click Update Users. This area will allow the administrator to delete a particular user on the account.